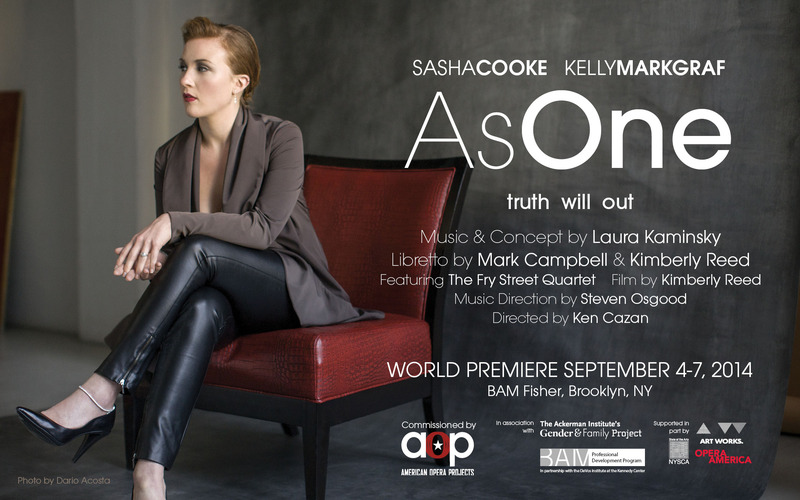 BROOKLYN, NY—AOP (American Opera Projects) announces the world premiere of As One, with music and concept by AOP’s newly-named composer in residence Laura Kaminsky, and with an original libretto by Mark Campbell and Kimberly Reed. With compassion, candor, and humor, As One chronicles the experiences of a transgender person as she emerges into harmony with herself and the world around her. Performances take place at BAM Fisher (321 Ashland Place, Brooklyn, NY 11217) from September 4 and 6 at 7:30 pm, and September 7 at 3 pm. Tickets are $25 and will go on sale in mid-July at BAM.org/AsOne. A monodrama for two voices sharing one central role, AOP commissioned the one-act chamber opera specifically for internationally-acclaimed singers (and real-life husband and wife) Kelly Markgraf, baritone, and Sasha Cooke, mezzo-soprano, who share the role of the protagonist. The production is directed by Ken Cazan, with music direction by Steven Osgood, and features the Utah-based Fry Street Quartet. The production design by David Jacques includes film by transgender filmmaker Kimberly Reed, director of the award-winning documentary, Prodigal Sons. Costume design is by Sara Jean Tosetti.The performance is the culmination of AOP’s participation in the BAM Professional Development Program, a professional training program led by BAM and the DeVos Institute of Arts Management at the Kennedy Center. Free panel discussions with the artists will take place after the September 4 (“Creating As One,” moderator TBA) and September 7 performances (“Gender Identity in As One,” moderated by Jean Malpas, Director, Gender and Family Project at the Ackerman Institute for the Family). A second production of As One will take place at the Caine School of the Arts at Utah State University in April, 2015. For many years composer Laura Kaminsky has concerned herself with political and social issues in her music. Her compositions have included works about the natural world and environment (Rising Tide; Terra Terribilis), political and social issues (Vukovar Trio; And Trouble Came: An African AIDS Diary), and works which have been inspired by visual art concepts and artists (Cadmium Yellow, The Full Range of Blue). As a married lesbian, Kaminsky was intrigued by a 2008 article in the New York Times about the legal implications of a marriage in which one of the parties transitioned from male to female, which transformed the couple from hetero- to homo- sexual. For Kaminsky, the story also raised questions about self-identity, including what one is willing to give up in order to simply be oneself. It prompted her first ideas for a musical theater work on the topic. In 2011 Kaminsky saw Kimberly Reed’s documentary film, Prodigal Sons, the story of Reed, a transgender woman, and her return home to Montana for her high school reunion. The composer was moved by the story and was taken with Reed’s artistic sensibility; she wrote to Reed, asking for a meeting. Ms. Reed was intrigued by the concept and agreed to collaborate. While Ms. Kaminksy and Ms. Reed had a concept and visuals, they had not come up with a story. That’s when they turned to librettist Mark Campbell (who is most known for writing the libretto for the 2012 Pulitzer Prize-winning opera, Silent Night). In their first meeting, Mr. Campbell asked Ms. Reed to relate her own experiences and, moved by her humor, bravery and compassion, began envisioning a story about the journey of a transgender person from youth to adulthood. The resultant libretto, written by both Ms. Reed and Mr. Campbell, is told in three parts and is organized into songs that were inspired by Ms. Reed’s story, the stories of other transgender people, and the themes they felt were necessary to explore. As One was developed through public workshops at AOP under its First Chance program. AOP has developed and/or produced over 20 world premiere operas, many of which started within First Chance, including most recently a sold-out co-production of Lera Auerbach’s The Blind (Lincoln Center Festival 2013), Tarik O’Regan’s Heart of Darkness (Royal Opera House, London), and Gregory Spears’ Paul’s Case (UrbanArias, PROTOTYPE, Pittsburgh Opera). Commissioned by American Opera Projects, As One is supported in part by funding from OPERA America’s Opera Discovery Grants for Female Composers Program, supported by the Virginia B. Toulmin Foundation, the New York State Council on the Arts with the support of Governor Andrew Cuomo, the New York State Legislature and the National Endowment for the Arts (NEA) Art Works, Bronx Council on the Arts, Purchase College Development Fund, Tanner Fund, Jeremy T. Smith Fund, Dr. Coco Lazaroff, Lynn Loacker, Judith O. Rubin, and many generous individuals. Special thanks to Purchase College Conservatory of Music and Utah State University. As One is presented by AOP as part of the BAM/DeVos Institute of Arts Management at the Kennedy Center Professional Development Program (PDP). 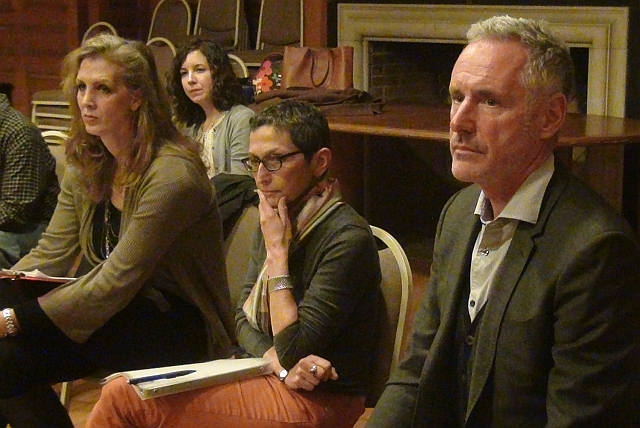 Creators Kimberly Reed, Laura Kaminsky, and Mark Campbell (with Mila Henry in bg) at early AOP workshop of As One. Laura Kaminsky, recently appointed Composer-in-Residence at American Opera Projects, has received commissions, fellowships, and awards from the National Endowment for the Arts, Koussevitzky Music Foundation, Opera America, and the Copland Fund, among others. She has received six ASCAP-Chamber Music America Awards for Adventuresome Programming and is the recipient of the Polish Ministry of Culture and National Heritage 2010 Chopin Award. She is on the faculty at the Conservatory of Music at Purchase College/SUNY. Her music is recorded on the Albany, Mode, MSR, Innova and CRI labels. Mark Campbell is one of the most in-demand librettists working in opera today. His last opera, Silent Night, which he wrote with composer Kevin Puts, received the 2012 Pulitzer Prize in music. He has written nine operatic works, including Later the Same Evening, Volpone, Bastianello/Lucrezia and Rappahannock County. He is currently working on operas based on the novels The Manchurian Candidate (Minnesota Opera, 2015; composer: Kevin Puts), The Shining (Minnesota Opera, 2016, composer: Paul Moravec), The Trial of Elizabeth Cree (Opera Philadelphia, 2017; composer: Kevin Puts) and the play Dinner at Eight (Minnesota Opera 2017, composer: William Bolcom). Kimberly Reed’s work has been featured on the Oprah Winfrey Show, CNN, NPR, and in Details Magazine. Her work has made her one of Filmmaker Magazine’s “25 New Faces of Independent Film.” Kimberly Reed directed and produced Prodigal Sons, a “whiplash doc that heralds an exciting talent.” Prodigal Sons landed on many Best of the Year lists and garnered 14 Audience and Jury awards, including the International Film Critics’ FIPRESCI Prize. Ms. Reed was recognized in OUT Magazine’s “Out 100,” and as Towleroad’s “Best LGBT Character of the Film Year” in 2010. Grammy Award-winning mezzo-soprano Sasha Cooke has been called “the luminous standout” (New York Times) and “equal parts poise, radiance and elegant directness” (Opera News). Ms. Cooke’s past season included performances with the New York Philharmonic, San Francisco Symphony, and Deutsches Symphonie-Orchester, among others. Additional highlights included a production of Anna Bolena at the Opéra National de Bordeaux; recitals at Wigmore Hall, Emory University, and Lincoln Center’s Alice Tully Hall. Her recordings are available on Bridge, Naxos, and Music@Menlo Live labels, as well as her solo album on Yarlung Records. In addition to As One, Kelly Markgraf’s 2014-15 calendar features his debut in the role of Don Pizarro in Fidelio with Madison Opera, and the role of Heathcliff in a concert and subsequent recording of Carlisle Floyd’s Wuthering Heights with Florentine Opera. He returns to Florentine later in the season as Belcore in L’elisir d’amore, and makes his debut with the Saint Paul Chamber Orchestra. Last season brought a debut with Austin Lyric Opera, performances of Beethoven’s 9th Symphony with the Green Bay Symphony, and Bach’s St. Mathew Passion with the Oratorio Society of NY at Carnegie Hall. Hailed as “a triumph of ensemble playing” (New York Times), Fry Street Quartet has perfected a “blend of technical precision and scorching spontaneity” (The Strad). The ensemble began its international career in 2002 as cultural ambassadors to the Balkan States, sponsored by Carnegie Hall and the U.S. Department of State. They previously collaborated with composer Laura Kaminsky in a multi-disciplinary performance with physicist Dr. Robert Davies, called The Crossroads Project. The Fry Street Quartet holds the Endowed String Quartet Residency at the Caine College of the Arts at Utah State University in Logan, Utah. Ken Cazan is Resident Stage Director for the Thornton School of Music at the University of Southern California. He has directed more than 100 productions for more than 40 opera companies, including the Santa Fe Opera, Atlanta Opera, Seattle Opera, Opera Theater of St. Louis, Opera Omaha, Austin Lyric Opera, Chicago Opera Theater, Opera Hamilton, Portland Opera, Fort Worth Opera, Lyric Opera of Kansas City, and Syracuse Opera, among others. Mr. Cazan holds a B.F.A. in acting, directing, and dance from Syracuse University. Steven Osgood, conductor. Notable engagements include: Xenakis’ Oresteia (world premiere, Miller Theater); Tan Dun’s Marco Polo (De Nederlands Opera), La traviata (Edmonton Opera), Tosca (Chautauqua Opera), Conrad Susa’s Transformations (Juilliard Opera). As Artistic Director of AOP from 2001 to 2008, he conducted the world premieres of Paula Kimper’s Patience and Sarah (1998 Lincoln Center Festival), and Janice Hamer’s Lost Childhood (Tel Aviv, 2007). He also created and is artistic director for the company’s nationally recognized Composers & the Voice Workshop Series, soon entering its eighth season. The BAM Professional Development Program (BAM PDP) is a 9-month program that utilizes the strengths of both institutions to provide professional development training and deeply discounted theater and rehearsal studio rental to an annual selection of qualifying non-profit arts organizations. Through the program, supported by Brooklyn Community Foundation and The New York Community Trust, BAM and the DeVos Institute of Arts Management at the Kennedy Center, strive to help arts organizations expand their skill base, increase their institutional capacity, and build necessary foundations for their long-term success. The program culminates with each participating company presenting a self-funded production in the BAM Fisher’s Fishman Theater Space. For more information about transgender issues please visit the GLAAD WEBSITE. You are currently browsing the Have a Voice blog archives for July, 2014.